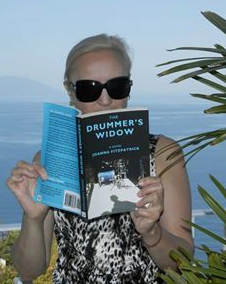 A Reading of "The Drummer's Widow"
Last night I did a reading at the California Writers Club. Great fun. After all the years I've spent as an artist manager making it possible for singers and musicians to get up on stage and perform while I watch from the wings—it's really quite spectacular to be the one out on centerstage. I remember sitting in front of my computer, hands poised, confronting the blank screen. The cursor winked. Nothing else. Not a word. I was at a Writers Retreat on Hatteras Island, NC, where everyone was suppose to produce 2000 words per day. Frustrated, I looked through the window seeking inspiration from the stormy Atlantic Ocean. Its waves muffled through the closed window, but I felt its unrelenting power to give and take away. Why are you talking to an empty chair? I ask my new character that I call Marisa. That question cracks open the seed of a novel. A novel that will keep me occupied for the following three years when I'm not taking care of my husband. Whenever Jim sniffles, or has an open wound, or says he’s tired and lies down, or complains of stomach pains, I go on high alert. I have to. He has a compromised immune system and a simple cold could become pneumonia and then, with no defenses, death. Fortunately for me, Jim knows how to survive. He wears gloves when he goes outside. He never touches the subway railing where other hands have been, other hands that might carry a virus or bacteria. So even though it had been five years that he's been in remission from his stem cell transplants, I remain on high alert. Our summers are spent in southern France. Jim, a jazz drummer like my character Jules, practices in an ancient sheepherder’s bergerie on an isolated mountaintop; his only companions the sheep grazing nearby who don’t care how loud he plays his music as long as he doesn’t eat their clover. It was in France last summer that I finished the final chapter of Marisa’s story and asked Jim to copyedit it. That’s asking a lot because he has his own projects to complete. But he’s a good guy and he took the first chapter I handed to him and headed off for his workday on the mountaintop. That evening we were seated on the terrace. The mid-summer sun was still shining and the sky was still blue. But at that moment Jim couldn’t see the sunlight or feel its warmth. His depression was my fault. Rather than talking to him about my fear of grief and loneliness, I had written it into Marisa’s story, where he found it, and it deeply upset him. When he had been in the hospital fighting for his life, I had saved my tears for the shower where he wouldn’t hear my premature wails of sorrow. How could I tell him about my own selfish fears when he was fighting so hard to stay alive? On the terrace that evening, I flipped through the twenty corrected pages he’d marked in the columns and between the lines in irreversible red ink. I told him I was sorry. I meant the novel to be a tribute to his life and hadn’t realized he would see it as a death rattle. The next morning he made his lunch, a baguette spread with duck paté, Camembert cheese, and a neighbor’s heirloom tomato. He thinly sliced the tomato and placed it in the middle of the paté then wrapped the baguette in paper and slipped it into his backpack. He frowned when I handed him the second chapter, but he took it. Alone at my desk I looked disparagingly at the edits he’d made with the same diligent and exacting care when he slices tomatoes for his sandwiches. He knew better than I did what my novel needed—a fat cut. And he saw where I scrambled the words and, aknowing what I wanted to say, made it clearer. I ws thrilled. All these years I’d been living with a brilliant editor and hadn’t known it. While the late summer light still lingered, we would sit each evening on the terrace and move forward together as Marisa moved forward out of grief and into a new life without Jules. We discussed plot flaws and character weaknesses. He offered suggestions. I countered with my own. I’d laugh when I read a line he’d added to Jules’s dialogue as if he was Jules. Other times, tears welled up when I read his encouraging comments. I was feeling Marisa’s pain when she realized the sound of Jules’s voice was fading from her memory and soon she’d have to find the courage to go on without hearing him anymore. When we returned to our home in Monterey, California, Jim was diagnosed with a second cancer. It was at the same time as my book release. I had to ask myself if I’d done something rash and unsavory entitling my book “The Drummer’s Widow.” I asked Jim what he thought. Before becoming a writer, I managed Divas. So it was natural for me to write about them in my character Cassandra. But I also turned to the Divas I knew for help. And now that The Drummer’s Widow has been published, I want to pay tribute to Aretha Franklin, Jennifer Holliday, Whitney Houston, Yvonne Jackson, Etta James, Carole King, Cyndi Lauper, Laurel Massé, Bette Midler, Gretchen Peters, Linda Ronstadt, Janis Siegel, Nina Simone, Ronnie Spector and Amy Winehouse who are not only Divas, but my Muses throughout the writing of The Drummer’s Widow. It was their voices, their lyrics, and their personal stories that made Cassandra real. There are certainly other spectacular Divas throughout recent history but this is a personal list centered around the singers, some that I worked with, who inspired me with their courage and determination; the Divas whose narrative song-poems gave me the lines I needed to trigger my own ideas as a novelist; the Divas who kept me crying, laughing, and dancing right up to the last written page of The Drummer’s Widow; the Divas who guided me through my darkest days while they too tumbled in the dark. Today I remember Whitney Houston who sang so encouragingly, “I didn’t know my own strength” and “not to break,” and then she tragically did. I think of Amy Winehouse who said before her untimely death, “I'm not here to be famous, I just want to challenge myself. If all goes wrong, I'll have my music.” Both of them got lost in the maelstrom. How would I have ever gotten through the first chapters of my novel, much less my adolescence, without Aretha demanding that you “gotta respect yourself”? How would I have made it through my failed marriage or Cassandra’s disastrous affair without Carole King’s illuminating lyrics “it’s too late" and "something inside has died”? And what about Cyndi Lauper’s ‘feminist’ rocker, “Girls Just Want to Have Fun.” When I first heard her belt out that song on the radio, I had to stop my car on Sunset Blvd. and get out and dance. Only a stone could resist moving to her rhythmic sound, just as Marisa, my protagonist, found her groove amidst overwhelming grief. These days I am experiencing a different kind of grief, a kind of literary post-partum depression for my lost diva, Cassandra, as well as the character closest to my heart, Marisa. The novel is finished … edited, printed, bound, slid onto the shelves of virtual bookstores all over the world. And those two women have left me all alone. So, feeling a bit homesick and out of place, I bought the reissue of Bette Midler’s memoir, A View from a Broad. When I peered at the glossy photos, I thought of my own small part in her story: The day her manager asked his new assistant, which was me, to pick Bette Midler up at the airport. “But how will I know her?” I asked, embarrassed. His lips turned up and he said, "You can't miss her." And when the Divine Miss M strutted down that airport corridor toward me with her flaming red hair, I saw what he meant. I also knew my life would never be the same again. This feeling of being stranded in the Universe, only supported by my own self-inflicted importance, comes on me when I’m building my website, and then, again, when I’m on my Facebook timeline where I expose my work, my words, myself. It’s all done in the hope that someone will hear me above the noise, or even better, will visit my lovingly constructed website. In anticipation, I hang photos on its walls and set my journal on a coffee table for my visitors to read. Lying next to it is a short story I wrote, and excerpts from Katherine Mansfield and The Drummer’s Widow. My scrapbook is there, too, its pages pasted with press releases and book reviews. I take pride in counting my new Facebook friends and I practically implode when the stats on my website go up and I can count the visitors who have passed through my living room. Their visits are sadly brief. If only I was really there, we might sit down and talk awhile about books and things. Release date: May 1, 2014 And am I excited. The Drummer's Widow was three years in the making and now here it is.